Helping Peruvian families living in poverty through relief and education. ​The word "Inti" is a Quechuan word for Sun. It represents the indigenous culture of this region and is a very important symbol of the Incas to remind us that we are all children of the Sun. Our goal and mission is to bring a little bit of "sunshine" into the lives of these people living in poverty through aid and education. We work towards empowering the communities to invest in themselves through educational initiatives whether it be teaching “Leave No Trace” principles, emergency care and first aid, or preventative care through proper hygiene and nutrition. We operate with little overhead costs, the highest being transportation costs to access these more remote villages. ​We are a team of U.S. and Peruvian volunteers. The founders, Angie Parris-Raney and Saul Palma Herrera, began this mission in an effort to advance previous work they had done helping people in this region. Our team has a love for the mountains, helping and healing people, and inspiring others to embrace this indigenous culture. ​We began in 2011 after the Sacred Valley region had experienced severe floods where homes were completely destroyed. At that time, we had provided some basic food items and blankets to help some of the families. 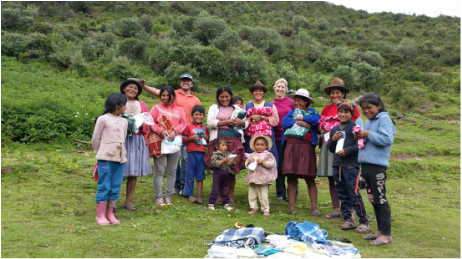 Since then, we have continued to provide basic aid to families living in the high Andes, including clothes, shoes, blankets, food items, solar lamps, and most recently, first aid kits. As we distribute these items, we strive to leave behind a little bit of education. Some of our past initiatives have included teaching Leave No Trace principles to chasquis (porters of the Inca trail), disease prevention by washing hands, and assisting in physical therapy exercises to children with disabilities. Join us on our Munay Tour Sept 5-15, 2019! Visit www.TravelBugGal.net for trip details.